If you died tomorrow, if some kind of disaster struck and removed you entirely from the world, would the choices you'd made with your life to date matter? Would it matter what you had accomplished? Who you had loved? If you had saved another's life? Would your life's work have meaning? Would there not be at least a single day in the course of your years that managed to have repercussions beyond the limits of your own knowledge and time? I know very, very few people who would say, "no, none of it matters." It's a nihilistic and bleak point of view to maintain, that the inevitability of the final conclusion — for indeed, we are all mortal — overrides the importance of what one does along the journey. To be human is inevitably to face death. The moments we live for, before the end comes, are what define us. So, too, for the life and times of Commander Shepard. When I played Mass Effect 3 through for review, I was short on time. I finished the whole thing in about 23.5 hours' worth of play, crammed into two weeknights and one very long Saturday. I completed the game successfully, in the sense that I ended the reaper threat, but it was more or less in the worst way possible. This Shepard (who was not my Shepard) and her allied forces were not truly ready, and I'd faced a long, agonizing series of lose/lose decisions along the way. One of Shepard's closest allies had committed suicide in despair, and many others had been lost on missions. Garrus and Liara, the Commander's right and left hands for so many years, her closest friends and most stalwart allies, died in London. Rushed for time, exhausted, and deeply burdened by grief I was feeling for admittedly fictional characters, I simply made Shepard's final choice without much regard for which of the two available options I was picking. And so it came to pass that Shepard broke the cycle of chaos and order once and for all, but in so doing she didn't only sacrifice herself. She sacrificed pretty much everything, ultimately achieving destruction on a scale even the reapers couldn't achieve. Shepard killed everyone. I killed everyone. After the credits rolled and the final scene faded, I sat up until well after two in the morning, unable to sleep, haunted by the outcome of a video game. And there, on the sofa, in the darkest and most solitary hours of the night, I realized the truth: I need to be more selfish than that. I don't care if Shepard lives. I wish she could but I understand if she can't. But others need to. Some of them need to make it, need to carry the legacy of what they learned and what they did. Their worlds will never, ever be the same but they'll be there, to tell the stories and create homes. There is no "everybody lives" moment coming, no perfect moment to make everything work for everyone. But Shepard can save others, and to the best of my ability that is what I will have her do. That's the Commander I need to play. And despite the finality and of Shepard's ultimate choice and the similarities of the conclusions, there still remain as many unique Commanders Shepard as there are players to control him or her. 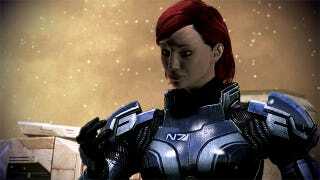 The full story of Shepard, the whole Mass Effect trilogy, as it turns out, is neither a romance nor a tragedy. The closest analogue is an epic. Myths and legends handed down over centuries, told by parents to children, by prophets to followers, by bards and singers to halls full of eager ears. The story will always end the same way, will always have the same moral, the same sweeping vistas and battles, but the details — ah, the details. Don't those always change in the telling? Shepard was a woman. A man. Dark-skinned. Pale as moonlight. In love with an asari, a turian, a fellow human. Kind and generous, ruthless and bold. She saved the council and pitied the geth. He destroyed the krogan and saved salarians. And no matter what, Shepard defeated Sovereign at the Citadel, escaped from the Collector base on the far side of the Omega-4 Relay, and came at long last to be standing with the Catalyst, there to decide the fates of all. The self-sacrificing savior is the central figure of modern Western mythology, and has been for centuries. That's the core of Christianity, and it's a major factor in countless stories. Even at the subconscious level, the story of the redeemer who gives his life for the future of all has become a deep and immutable link in our collective narrative tradition. Shepard is practically the platonic incarnation of the messianic archetype, inevitably martyred for the saving of all. And that it is where we find Shepard in the end: on the plane of mythology, removed from the plane of men. And that is also where many players feel they lose Mass Effect, because until the final moment, the plane of men has been the only ground the game knows. Shepard may have died (in the act of saving her crew) and been resurrected to walk the world again, but she has remained firmly, immutably human. The first two entries in the trilogy, as well as most of the third game, concerned themselves entirely with physical, tangible needs: disable a gun, set up a supply chain, shoot an enemy, save a colony. The reapers may be an existential threat on a terrifying scale, but they are visible, and can be touched and beaten. Where the physical plane gets lost by dallying too close with the metaphysical one is in conversation with the Catalyst. Appearing to Commander Shepard in the form of the young boy who died in Vancouver at the start of the game, the Catalyst takes on the role of deus ex machina in an astonishingly literal way, standing forth as the guiding hand over all organic and machine life in the galaxy for millions of years. This is the deity of the Milky Way, whether it calls itself that or no, and its presence creates a major shift in the tone and the goals of the series something like 98% of the way through the third and final game. Some players embrace that tonal shift. Others will forever reject it. I personally, as a player, love Mass Effect 3 in a way I have loved very few games before, but even a week after first watching Shepard meet the god of the Citadel, I am of two minds about its presence. I wish that we could have had more clarity leading up to this point, while also understanding that even for the biggest badass in the galaxy, some things simply are, and cannot be changed. The reaper threat has always been so incredible, so massive, that even the biggest and most united armada the whole galaxy could muster seemed insufficient to beat it back. We know, now, why the reapers have been designed this way and why they scour the galaxy clean. But the answers to mysteries, alas, are often unsatisfying, particularly when they raise more questions than they answer. And in this case, the lingering questions are as philosophical as they are logistical. Perhaps Mass Effect 3 really is a bleak endorsement of a joyless philosophy. In an argument between fate and free will, we are left with the reasonably free will of the player against the stark and unforgiving fate handed out by the game's designers. And yet, to argue that Shepard's choices cease to matter, to argue that the player's input ceases to matter, seems to miss the point not just of the game but of existence itself. The player's control over Shepard's fate always was, in most ways, an illusion, across all three games. But what a strong and passionate illusion it was. At the end of all things, when Shepard's story culminates in one painful, limiting final choice, the player truly feels the limits of the walls that a game puts up. We cannot ask a "why" that isn't coded, and we cannot force a happy ending through sheer force of will. Did Shepard love well? Did he do the best he could with the time that was given to him? Did she stand strong against unrelenting odds, and inspire faith and courage in others? Did the player laugh, gasp, and cry while guiding the Commander through his trials? If so, then Shepard's martyrdom and ascent from history into myth serves the purpose it was meant to do.